Fiction – hardcover; Random House Canada; 333 pages; 2016. 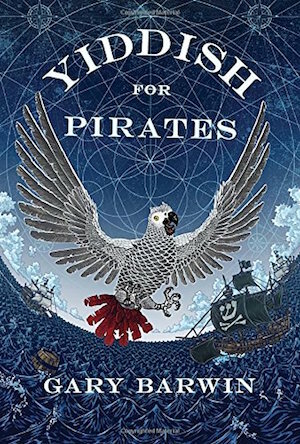 If there is one thing I can say about Gary Barwin’s Giller Prize-shortlisted Yiddish for Pirates it is this: I’ve never read a book so jam-packed with word play and creative use of language as this one. I would describe it as a kind of literary vaudeville; a mesmirising act of vocabulary, idioms, metaphors, puns and similes. And, if that’s not enough, it’s narrated by a 500-year-old parrot with a penchant for jokes and scathing one-liners. Yes, really. Sounds exciting, right? But this is where I put up my hand and confess that Yiddish for Pirates was really not for me. Maybe I have a prejudice against animal narrators (for instance, I hated last year’s Giller winner, Fifteen Dogs, which was, of course, narrated by a succession of canines), but I just couldn’t engage with the story. It was too clever, too knowing. I was always aware that I was reading a book; I was always aware of the word play and the creative writing “stunts”. Oh, and by the way, the Caribs are people who eat people. And you can pick your teeth. And you can pick your friends from your teeth. Sometimes little bits of them get stuck there after a nosh. — but the unrelenting nature of them (every single line, in fact) became wearing. I longed for Barwin to relax, to just tell the story, to let the words breathe. The sails were pale papers waiting to be written on by the wind. But for every great zinger of a description, there’d be another that perplexed me completely. At least when I wasn’t feather-puffed geshvollen and stultiloquent blather and narishkayt. I think it’s fair to say that by the last page I felt wrung out by this curious, convoluted novel. If I didn’t have to read it for my Shadow Giller jury obligations, I’m pretty sure I would have cast it aside — set it adrift, so to speak. That doesn’t mean it’s not a good book — as a feat of imagination, as a literary exercise and as a truly unique story it’s pretty hard to beat. For a more positive take on this novel, please see fellow Shadow jury member Naomi’s review. I can see how the wordplay could become too much, but it must depend on the person or the mood, because I marveled at it the whole way through. I’ve requested another book of his (a novella, I think) through my library’s ILL system just to compare. I hope it comes through!